Copra is the processed, dried meat of coconut which is the fruit of the coconut palm (Cocos nucifera), it is utilized in the extraction of coconut oil. After extracting coconut oil, the leftover residue of the coconut is called copra. Coconut oil is extracted from copra dried (coconut meat), making it an important agricultural commodity. It also yields de-fatted coconut cake after the oil extraction, which is mainly used as feed for livestock. Considering the benefits of this coconut product, the importance of it in modern day cannot be over-emphasized. Despite the popularity of coconut, a lot of people are still not aware of the entire commercial values of the produce and its byproducts. The firm white coconut meat of a matured coconut is processed in high heat at a certain temperature to remove the moisture content from the coconut. Then, the coconut becomes dry and light brown. This product is called the copra. Then the hard outer shell of the coconut is removed, and is further treated for various uses. This copra is further processed in many ways to extract oil from it. Copra can be made by smoke drying, sun drying, or kiln drying. The main purpose of copra is to extract oil. Coconut oil is commonly used in baking and cooking and is a favourite ingredient in beauty products for its moisture and texture. Apart from extracting coconut oil from copra, coconut butter can also be made from coconut copra. Coconut butter can be used as a vegan butter which has high nutritious value and can serve as an alternative for dairy butter. 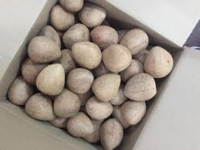 Copra has high protein content and is used as a primary product in livestock feed. It is included in feeds of animals like cattle, sheep, deer, horse, pig, poultry, fish. Its high oil and protein levels are fattening for stock. It improves the skin texture in horses, conditions the body and improves the shiny coat on the skin of horses. It is used in pig diet to increase the growth rate of the pigs. It is also used as poultry feed to increase growth rates. Researches show that using soaked copra meal in the diet of Nile Tilapia fingerlings has improved the growth and nutrient utilization of the fish, which in turn has resulted in the cost reduction of the fish. The advantage of using copra meal as animal feed is that it is abundant and cheap. Across Asia, especially in India, a whole coconut, sometimes copra slices, are also used for religious purposes. All religious ceremonies in Hinduism begin with the proposal of whole coconut, copra or the coconut water to the deity Ganesha, who helps in the successful completion of any work. Any serious business should begin with the ceremony of breaking a coconut. Coconut is grown in 22 states of the country, with Lagos State being the largest producer. The country produces 250,000 tonnes annually and is ranked No.18 producer of coconut in the world. The drive for economic diversification is likely to see greater emphasis on coconut production and processing. On a commercial scale, the dried copra is transported to large industrial oil mills to process CNO (Coconut Oil) for commodity markets. CNO can be found in many products: skin lotions, shampoo & conditioner, soaps and detergents, cooking oil, and medications for abrasions, skin rashes, and burns. It’s everywhere! The world's largest importers of coconut oil include the European Union, the United States, Malaysia, China, and Korea. In 2018, the European Union alone imported 475,000 metric tons of coconut oil. The demand and popularity of this product does not seem to show any signs of slowing down anytime soon.